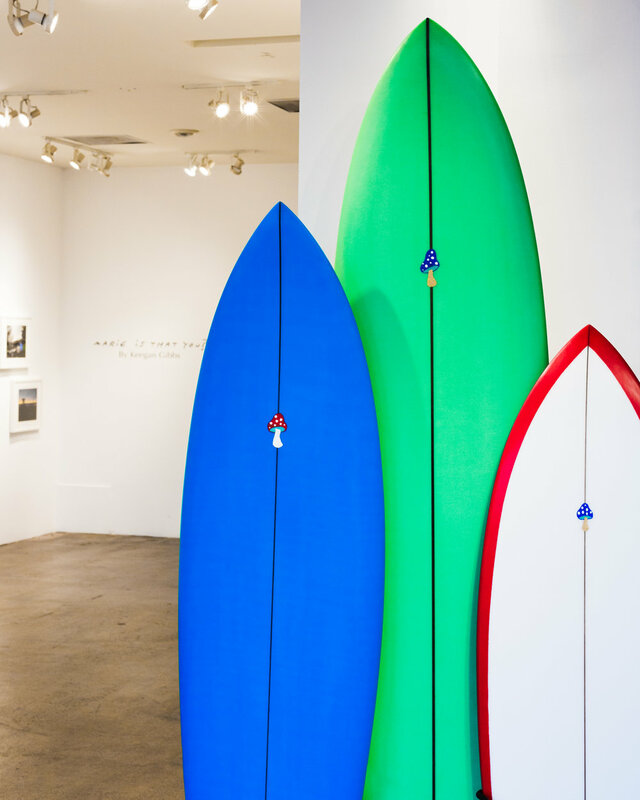 Installation of the “Marie, is that you?” show at > Depart Foundation in Malibu, California. 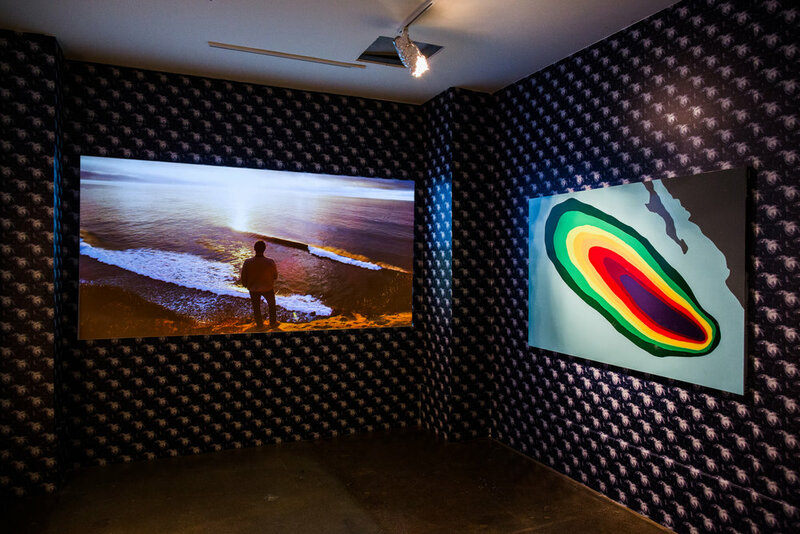 The multimedia show animates the emotions, and the peripheral, of the surfers experience, with a theme regarding the left over expectations from the exemplary 2014 Hurricane Marie. 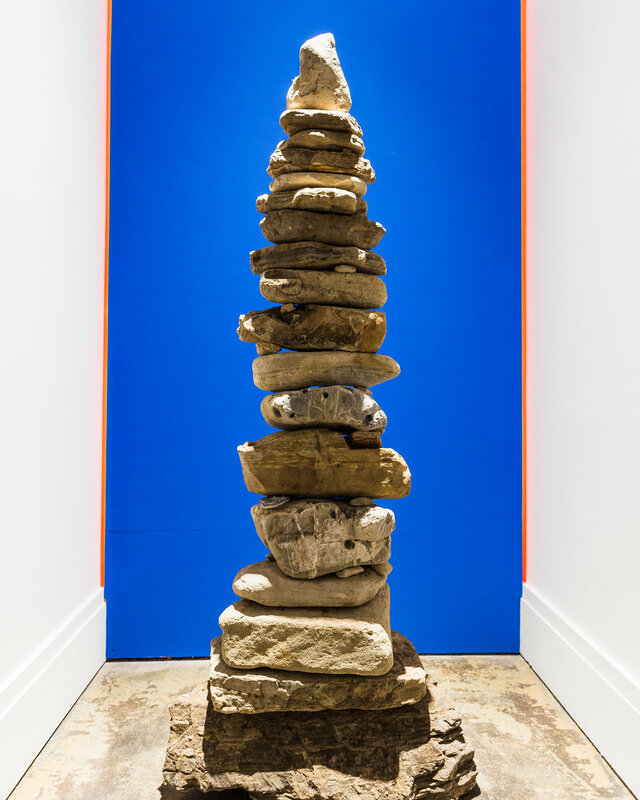 At the entrance stands a “Portal” rock balance sculpture, typical of the experience at the cobblestone points of Southern California. 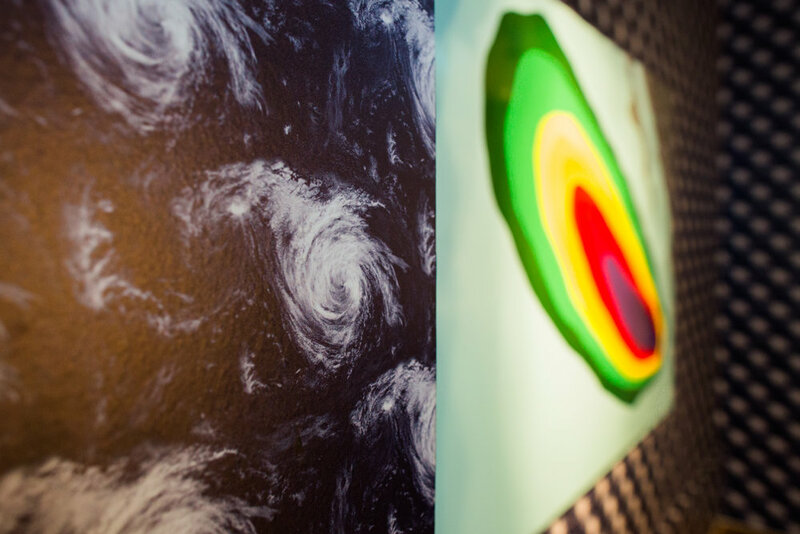 Above the portal, is a swell model painting of the peak intensity graphic of Hurricane Marie, downloaded from the CDIP Monitoring and Prediction System from University of California San Diego. 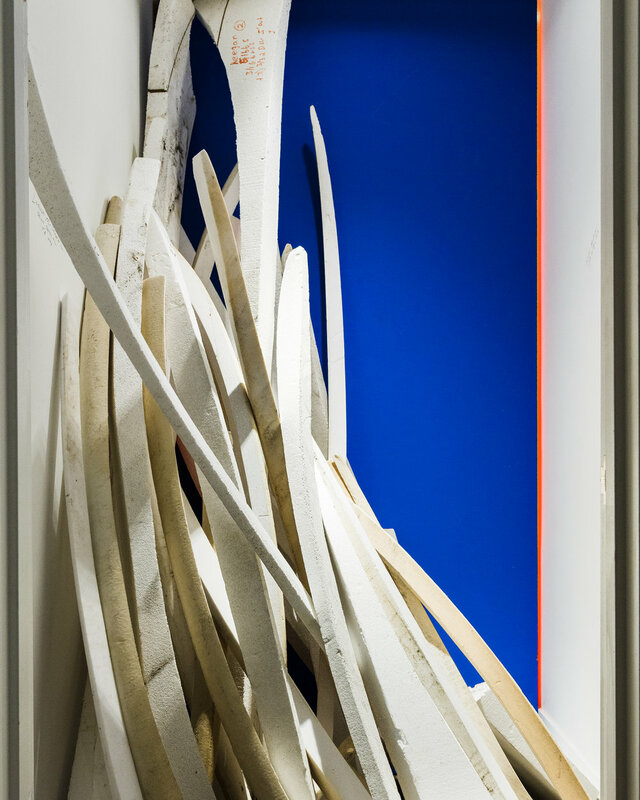 The piece is 60” x 48” titled “9ft @14 Seconds, 165 degrees” Enamel on artist fabricated steel panel. Inside the first room is a 25 minute film that embodies the universal experience of checking the surf. A series of landscape portraits, slowly creep zooming out to reveal the location and conditions, just as standing checking the surf does. Seemingly infinitely cladding the wall is a wallpaper of the satellite image of Hurricane Marie during peak intensity, printed on vinyl and applied to the wall. A constant reminder of what once was, and we all subconsciously, or consciously, yearn for again. Following the main room, there are 5 vignette rooms with separate installations. The first, titled “Perpetually Wet” hangs a wetsuit fountain that continuously drips. The second vignette, another rock monolith sculpture, courtesy of Eric “rock man” Piersen. A third vignette is the weather forecasting on a pedestal, the NOAA weather radio. The fourth, surfboard blank outline off-cuts, with walls clad in friends and their dimensions of boards currently on order. Last, the space where all the prior experiences, emotions and knowledge congregate, the shaping bay.